The featured picture is of a Rhesus Macaque on the banks of the mighty Teesta River as it curves through the ravines and gorges of the Himalayas in Sikkim and West Bengal, India. This post is a continuation of the previous article titled ICY HIMALAYAN SOURCE which traces the Origin of the River Teesta from Glaciers and Lakes in the Lofty Snow capped Himalayas. The Teesta River is known for it’s Emerald Green Waters which magically change to a Muddy Brown when Monsoon Rains Drench the Slopes of the Himalayas. Besides the Chameleon like characteristic defined above, the Teesta River is also the Lifeline of Sikkim and home to many villages which dot its bank as it curves through Forests and Mountains. The Rangeet river ( the principal tributary of the Teesta) merges with the Teesta River near the Teesta Bridge. The new Muddy Brown Robes of the Teesta River are clearly revealed against the waters of the Rangeet River in the picture below. The famous Coronation Bridge across the Teesta River before it descends to the Plains in West Bengal and Bangladesh thereafter. It was built to commemorate the Coronation of King George VI and Queen Elizabeth in 1937 when Undivided India was a colony of the British Empire. The Road also leads onto the Kingdom of Bhutan and North Eastern States of India. The Chameleon like Teesta in the plains near Jalpaiguri ( a township in the Doars region of West Bengal) reveals a vast White Sandy River Bed during the Summer. The Teesta River or as I call it the “Chameleon River” leaves India to enter Bangladesh and it is time to bid Goodbye. Trust you enjoyed the Journey through the Himalayas from Alpine Forests to Tropical Forests, from Icy Banks to the White Sands. 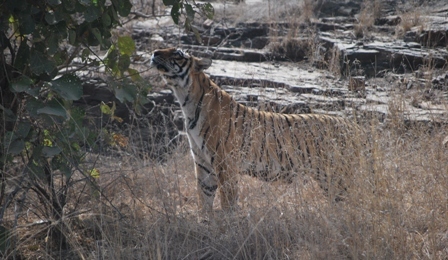 The Tiger (Panthera tigris ) is undoubtedly the KING OF THE JUNGLE. Much as I advocate and practice the art of enjoying every element of a forest or Jungle, nothing matches the thrill of viewing THE KING in its natural habitat. 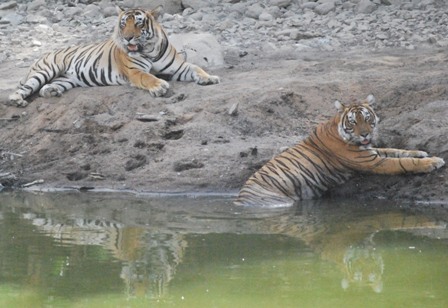 It is a life time’s experience to track and view tigers in the forests of India. 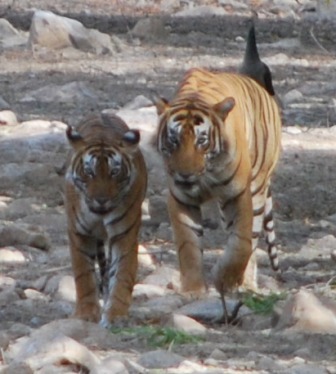 See the difference between the male and female Tigers. At the height of summer what can be better than a dip in the local pool. Do watch out how they enter the water, its rear first. With the KING watching can anyone dare to come to this Royal pond ? The peacock plays PEEPING TOM and watches the “JUNGLEE” ( wild in Hindi ) romance of the “Panthera Tigris”. The neck bites are accompanied by gentles roars which reverberate throughout the enchanting forest. Living you with images and hints. Write ups later. Got to go for Sunday Lunch . Nature is enchanting and narrates many a subtle story about LIFE. These two amphibians, despite living deep inside a dark well, give a message of HOPE . Despite clinging onto the sides of the well, submerged in water ( read problems) , yet, they always LOOK UP. 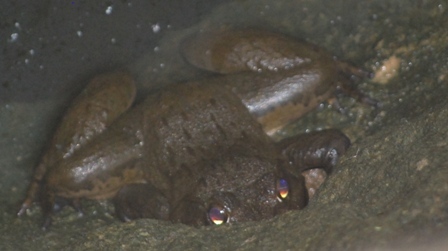 This large frog is submerged in water . 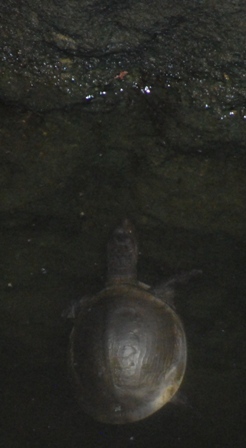 Turtle, hanging in just below the surface.Do observe the near absence of light. These amphibians were spotted in the depths of an abandoned well. Pictures were taken inside the vast free growing forest of the FORSYTH LODGE at THE SATPURA NATIONAL PARK, Central India.